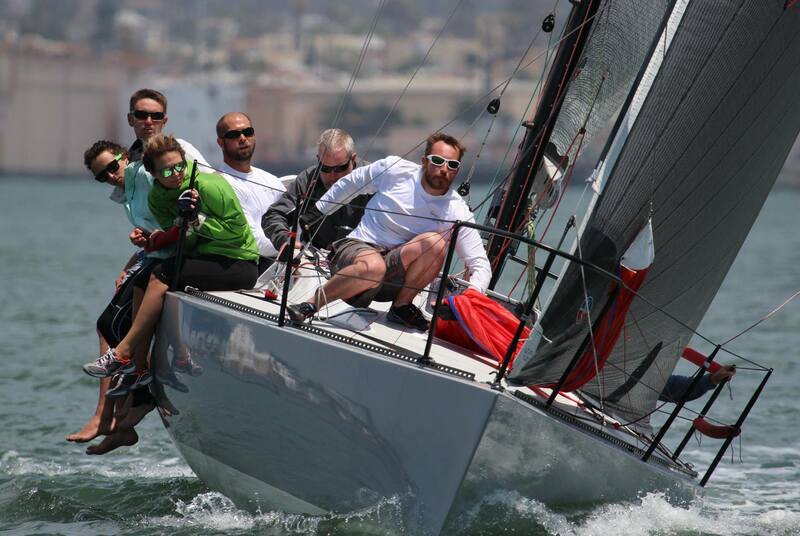 The 2016 Olson 30 National Championships were held at Dana Point Yacht Club, August 20 & 21. Day 1 of the 2016 Olson 30 Nationals started off with a brief Skippers Meeting and check in at DPYC followed by some quick dock talk and final boat prep. This weekend the Olson 30s would be joined on the race course by 5 FT-10s. Our goal for the day was to accomplish 4-5 races in a timely manner and make it back for some fun and festivities provided by DPYC and their staff. As the boats left the docks, the wind was already building and looking more like a typical summer’s day in San Francisco than Dana Point. Race 1 was a two lap W/L course with a majority of the boats choosing their #3’s. With the building seas and wind it made driving to weather difficult, but the downwind runs a real surf fest. Race 1 saw the proverbial National winners Blue Star taking a bullet, followed by Grey Goose, Hoot, White Lightning, Chaos Theory, and Sea Scout. Race 3 saw the building of the afternoon breeze with a couple boats switching back to their #3’s. Once again the race committee chose course 2, a two lapper, to send us around the marks. Tight starts and some luck provided some with golden opportunities. While the typical “go right” works, this race saw many left boats edging out the competition at the weather mark. Downhill rides were providing for some heightened adrenalin; remember boat under kite not the opposite, and giving the locals a run for their money. Final tally, Grey Goose with the bullet followed by Blue Star, Hoot, White Lightning, Chaos Theory and Sea Scout. Race 4, last race of the day, saw a pretty steady breeze in the mid to upper teens and the biggest swells of the day. All that can be said is WET! This time the race committee chose a simple 1 lap course to send the fleet. Single lap races are like a sprint, make it to the weather mark, don’t f-up down wind and then just head for home on the short beat back to the finish. Pretty simple, but it’s that first weather leg that can really make or break you. With the boats from the North basking in the big breeze the locals were left to fight for remaining seats. Final tally, Blue Star with the bullet followed by Hoot, Grey Goose, Chaos Theory, White Lightning and Sea Scout. Day 2 of the nationals started with a different tone. Today was more like Dana Point, less San Francisco. With everyone licking their wounds and trying to hastily dry out their gear we all prepared for another round of fun with 3 races planned for the day. Race 5 began in what most would say to be light conditions, here in Dana Point we say average or typical. A gentle sea breeze from the west provided the right opportunities for the locals and with a course 2 flag up off we went. White Lightning led to the weather mark and never looked back. Hoot and Blue Star were in hot pursuit and mixing it up for 2nd and 3rd. Goose and Chaos Theory followed suit with Sea Scout not far behind. It was nice to start and end a race dry. Race 6 saw slightly more breeze, but still well in the #1 range. With another two lapper called, everyone was well aware of the risks in loosing places as the final points were within sight. Close mark rounding’s and tight battles developed. Hoot broke out and showed everyone the way. Blue Star and White Lightning were in tight with only seconds separating them at the finish. Day 1 leader Grey Goose was hanging in but needed to pull out a win in the last race to maintain their lead. A 4th this race did not help. Final tally, Hoot with the win followed by Blue Star, White Lightning, Grey Goose, Chaos Theory and Sea Scout. Race 7, FINALLY! The Last race of the weekend and the final chance for some to make their move and claim victory. To intensify the competition, race committee decided to run a 1 lap race. Another sprint to the finish, were leg 1 was the deciding factor. At the start a few boats pressed a little too hard at the line causing some general recalls. Blue Star, White Lightning, and Sea Scout were all called over early. Unfortunately Sea Scout never heard the call and continued on, resulting in the OCS. This was Grey Goose’s opportunity to take the lead and claim 1st overall in the Nationals. Blue Star battled back but was unable to gain the 3rd place they needed to clench 1st. Final tally in race 7, Grey Goose with the win followed by Hoot, Chaos Theory, Blue Star and White Lightning. Once the dust had settled and boats put away everyone gathered at DPYC for trophies and free drinks. With Tito’s and Mount Gay flowing the trophies were presented to their rightful owners. I would like to thank all those that participated and especially to those that traveled to this event. It is owners like you that keep the class going and provide for spirited races. I encourage everyone to try, at least once, to make a National event. Competitive sailing is never better than when you are racing One Design. And just a heads up, there is talk of the 2017 Nationals being held in Channel Islands, CA so be prepared.